The ultimate duo. The Suit & the Tie! 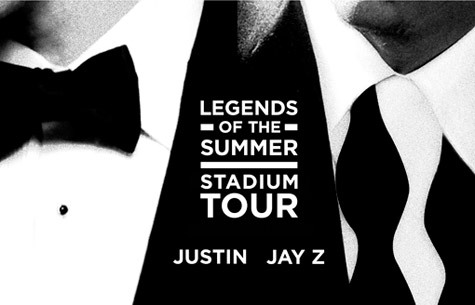 Justin Timberlake teams up with Jay-Z for this 'Legends of the Summer' stadium tour. JT has already featured Jay-Z on his debut single 'Suit & Tie' off his 'The 20/20 Experience' album, due March 15. Jay-Z already toured with Kanye West throughout the whole of last year on the 'Watch The Throne' arena tour, and is now teaming up with the big dawgs for this stadium tour, across America. Both Justin Timberlake and Jay-Z will be hitting up the big stage in London as they headline at the Wireless Festival on Friday, July 12 (Justin Timberlake) and Saturday, July 13 (Jay-Z) of this year. Check out the 12-day-tour dates to 'Legends of the Summer' below. Tickets go on sale on February 28 via Live Nation - all but for New York, which the sale information will be announced soon!